Now that … that was unexpectedly … well … maybe I should just say a lot of the premier ep of Kira☆kira Precure a la Mode was unexpected. 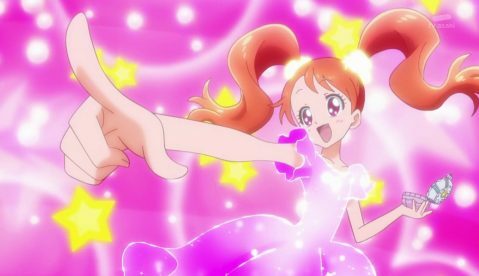 This is the 14th installment of the Precure franchise, coming hot on the heels of a (at least in my opinion) very well done series in Mahou Tsukai, and perhaps having some big boots to fill. Like every Precure series it has “common motifs”, and this time around it is a combination of baking desserts and animals (Tokyo Mew Mew, anyone? 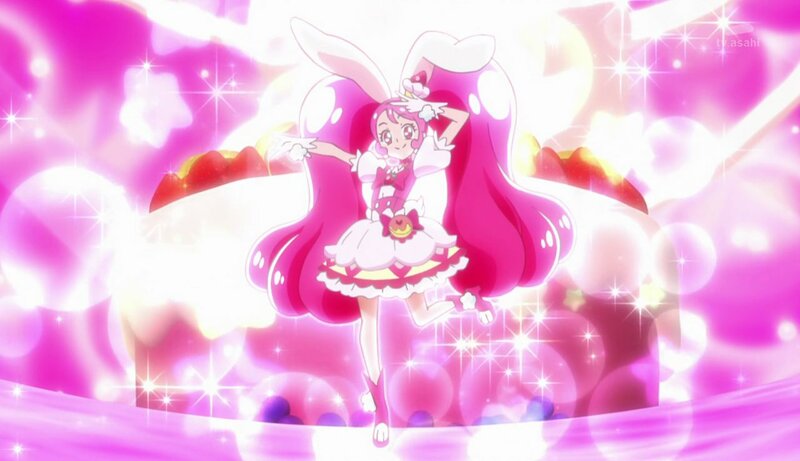 ), while the themes seem to be a combination of “happiness and imagination”. 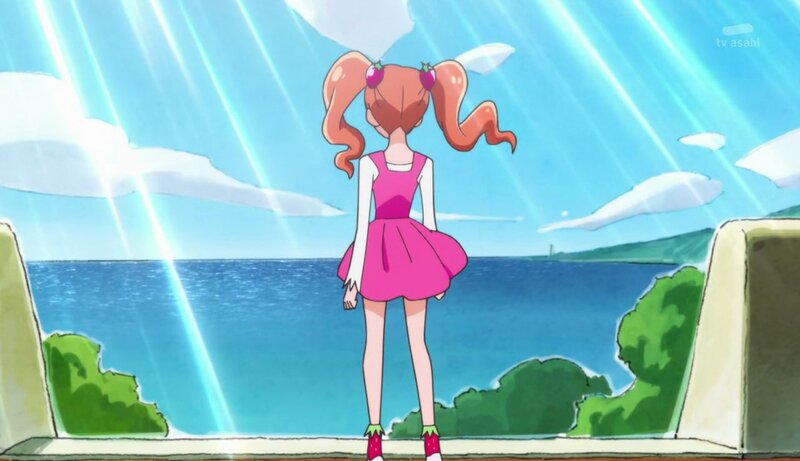 From the preview videos and visuals that came out before the series itself aired it was easy to see the motifs (and in fact episode 50 of Mahou Tsukai Precure introduced some of the cooking as well), but I was curious to see what sort of angles the series was going to use to present it’s themes. 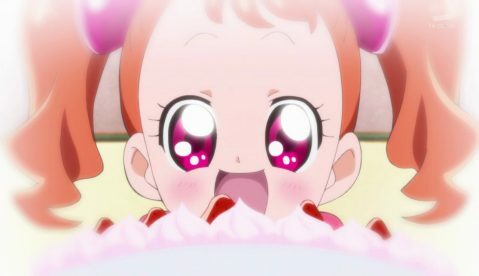 To be absolutely honest, while watching the first episode my first impressions were kinda “only okay”, and at other times I felt as if the series were either “trying too hard” to be funny or were using both Mahou Shoujo series in general (Shugo Chara came to mind, for example) and previous Precure tropes too liberally (I could spot a handful of what I felt were direct references to Smile Precure and even some of the OP elements reminded me of the OP of Futari wa PreCure) – it resulted in feeling like a hastily assembled mishmash of many different elements. 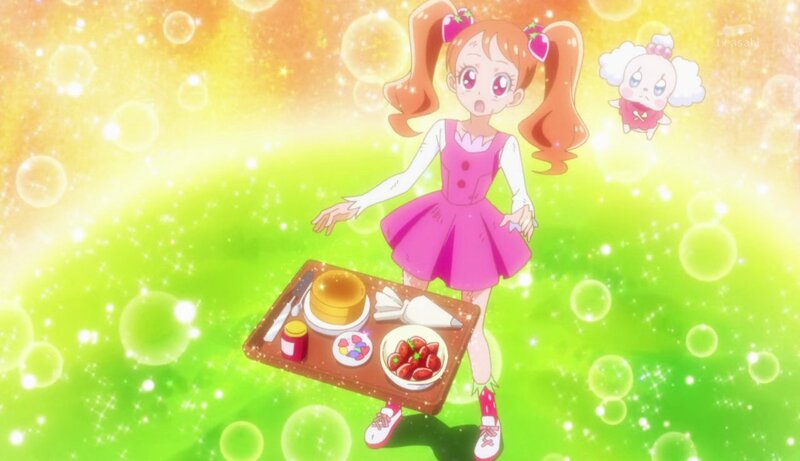 What’s more, it also included some live action footage in the middle of the episode (during an Insert Song moment for Ichika as she was baking) and some further live action footage at the end of the episode proper of dessert cooking – which I felt more comfortable with, to be honest, and had also seen it used before in Yumeiro Pattissiere, for example (which is a very underrated series by the way, and perhaps the first series where VA Yuuki Aoi really was able to stretch her wings and utilize her talents). 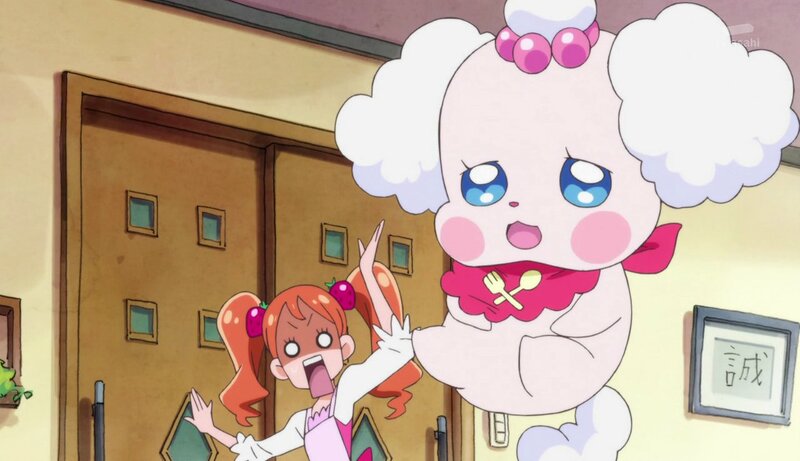 After the first episode was over I came to a conclusion that it was possible that the series might be targeted to the “younger spectrum” of the Precure audience and was continuing the process of “experimentation” that it was able to pull off very successfully in Mahou Tsukai. 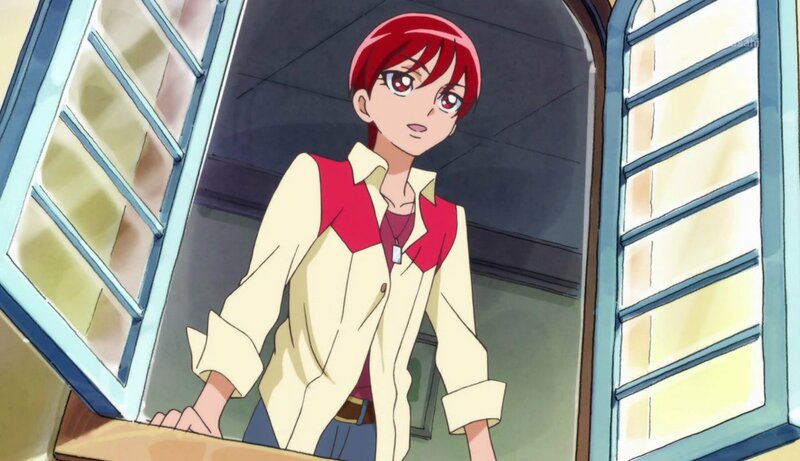 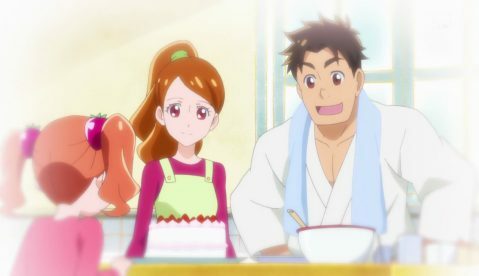 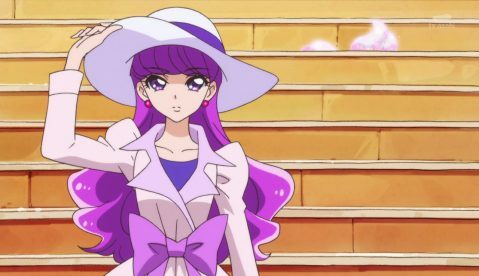 But I think that there may be more to it than that, and for that I am hanging my hat on the scene with Ichika and her mother and a scene in the OP of the Red Precure and her sickly younger sister. 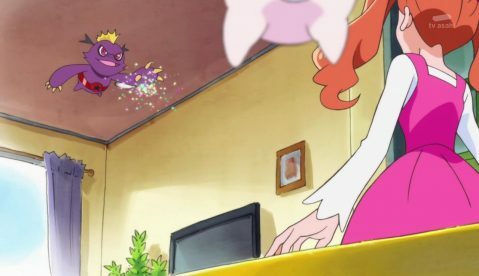 I think that those two may be occasions for tackling the theme of “happiness” mentioned in the official summaries, and that it might touch on more serious issues – that would definitely be a welcome route to touch on. There are other possibilities that could also be explored with the other Precure as well relating to striving for and valuing and achieving happiness in adverse circumstances. 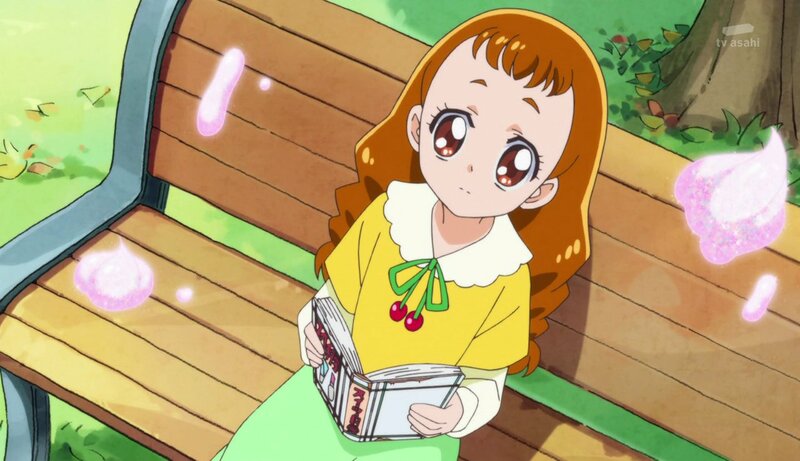 Also, I think that for the moment it may be too early to be able to correctly evaluate this series – Precure series starting out with a five member team are rare (Smile Precure and Yes Precure 5 being the main ones), and they have a character interaction and dynamic that is decidedly different from the other Precure offerings. Perhaps one ought to also consider that Ichika/Cure Whip is the same age as Haruka and Kirara from Go Princess Precure (! 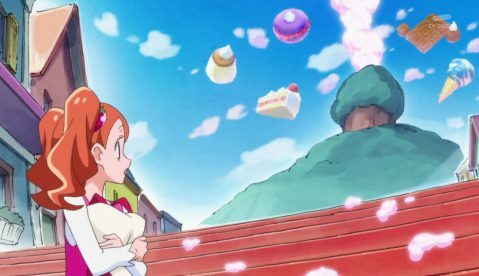 ), and that there are two high school students amongst the final five of the Kirakira Precure group – the red one (Cure Chocolate/dog motif) and the purple one (Cure Macaroon/cat motif). 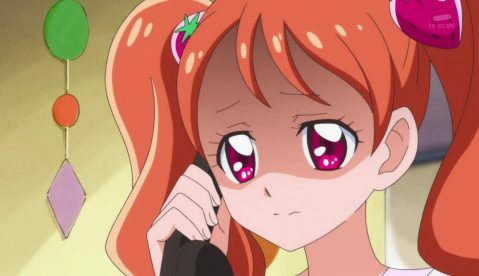 So the total age of the members is actually higher than many previous Precure series … go figure. 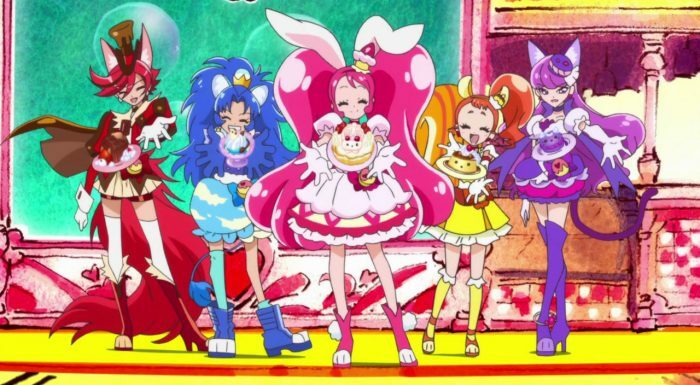 Ah … since I am thinking of it I should prolly also mention the other two Precure: the yellow one is Cure Custard/squirrel motif, and the blue one is Cure Gelato/lion motif. The good and evil fairies are battling once again, and once again the PreCure are dragged into the fray. 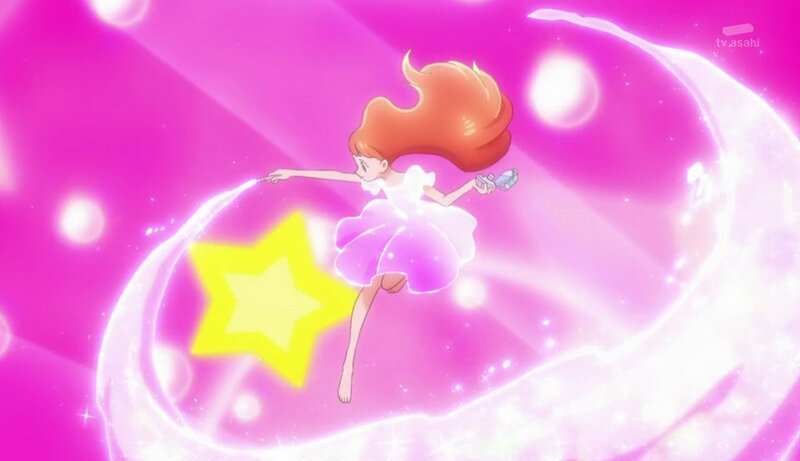 In terms of technical aspects, I did not think that there was much on a “stand out” level about the first episode. The MC Ichika was a classic pink Precure lead, but was emotionally volatile and extremely energetic, but her VA kinda did not do much for me. 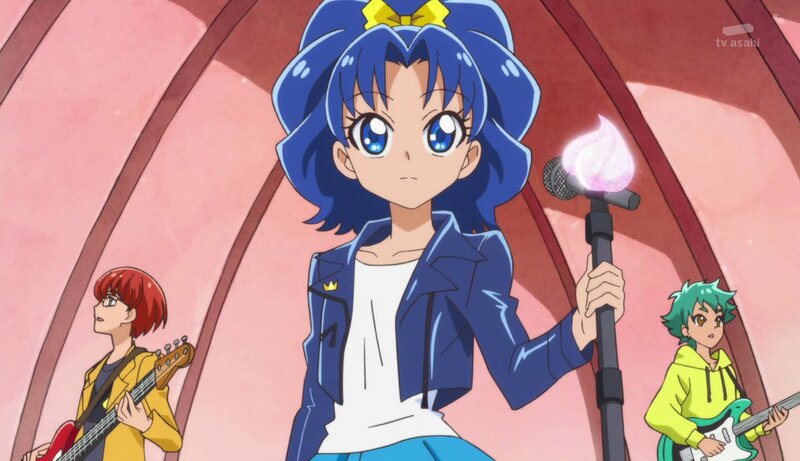 (Interestingly, her parents both had very famous VAs by the way.) 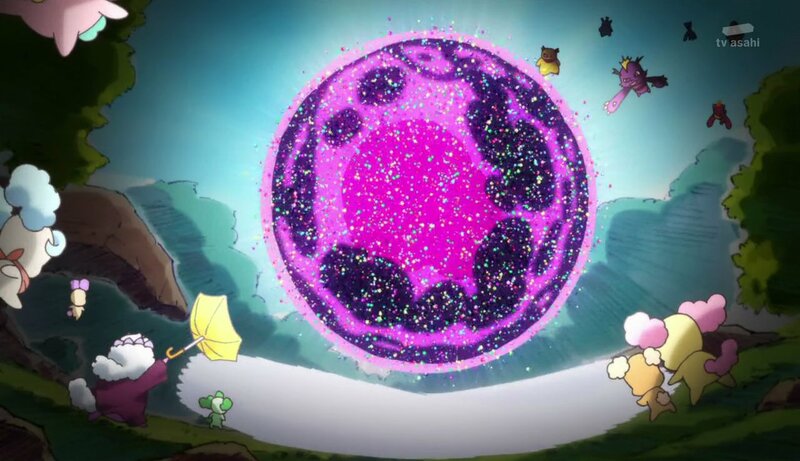 The visuals were decent, and the OST was a bit better. The fairy mascots and the evil fairies at the moment feel like a step down threat wise from Mahou Tsukai’s foes (who have the habit of eating stars and planets -_- ) but again, perhaps in time they will be able to step into their own. 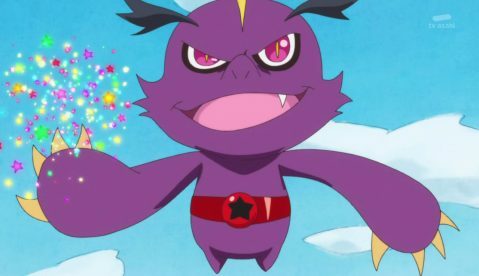 There was a moment in the OP where it seemed we were able to see another member of the “evil faction”. But speaking of OPs, I was happily surprised to enjoy both the OP and the ED, so that’s a step in the right direction.